A blogger's complaint that the static page he created has unwanted expandable post summary (if I understand him correctly is the push I needed to finally write this post on sub-domain. He suspect it may have something to do with the fact that he is using a template with built-in expandable post summary (again if I understand him correctly. He may be right but it looks that the static page one created via Blogger uses the same template. Anyway I figure his solution might be to abandon blogspot and upgrade to custom domain and create a sub-domain instead as the sub-domain can use any template which may or may not be the same as the original. It is practically a separate independent website. Look at the one I created recently faq.bloggertipsandtricks.com/ (still under construction). If you go to BT&T FAQ which is the title of that sub-domain, you may see me using the same template, but the blog title, sidebars, etc are different from Blogger Tips and Tricks. A bit more rambling. While for a long time, Blogger.com was negatively compared with Wordpress, since it abandoned the old classic template and forced everyone to upgrade to the new Blogger xml templates, Blogger has improved by leaps and bounds. Not only that, now coupled with Google Apps, you have a very easy "content management system" to create many things without getting too technical. In fact, I know that Google (here in Malaysia anyway) is working with a students from a University to help SME (Small and Medium Enterprise) using Blogger and Google Apps to create >websites for businesses. First you must upgrade to custom domain and I would suggest you not register directly your domain using other domain registra but do it via Blogger.com and Google Apps and you will find lots of what you need to do is automated for you by Blogger.com. No need to struggle with CNames, etc. etc. Once you have a custom domain, make sure you create an administrator account (email). Instructions should be emailed to you. Once you have created that administrator account, either log into that email or log into https://www.google.com/a/cpanel/yourdomain.com, making sure to replace yourdomain with the actual URL of your blog. If you ever forgot your admin password, refer to Google Apps "forgot password". (I somehow prefer to sign into my admin email, then click "Manage this domain" to get into the CPanel). 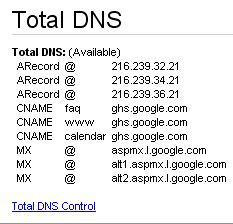 Click "Total DNS Control" and in the next window, under "CNames Aliases", click "Add New CName record"
then type in the sub-domain (eg. faq.yourdomain.com), and for Points to Host Name: enter ghs.google.com, click OK and you are done. Congrats, you have created a sub-domain for your blog. Thus for Host Name, type in the name of your sub-domain. For example, if I want to create forum.bloggertipsandtricks.com, I will type just "forum". 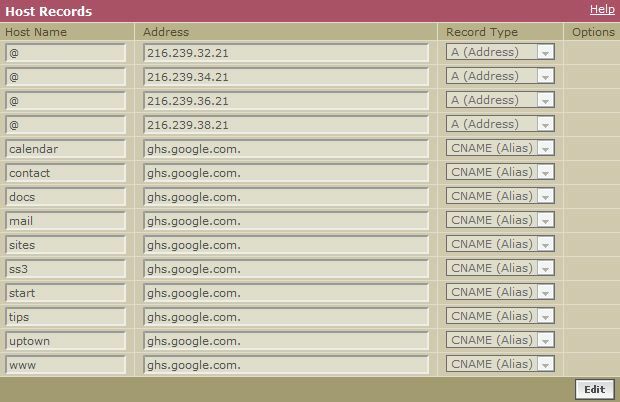 For the address, type or copy-paste ghs.google.com and for Record Type, choose CName (Alias). When done, just click SAVE and you are done. "clicking on image does not enlarge image: Why and how"
I did uploaded my pictures in compose mode, and dragged them in wanted position. Still when I published my latest entry, the images still has the pssibility/option to be enlarged by my visitors. I want my Published images to be "frozen". Not clickable. Do you understand what I try to do?? I will send you a link to one favourite blog I often visits. Click on her pictures, and you will se that they do not change size. Again I would be so thankful if you could help me with my problem!! Do yuu have another tips I could use?? Please leave me a note, if wanted in my blog, if you have the time to solve my problem. Hello Peter, the static pages get summarised because the script is active on the static pages. The script should be disabled on static pages by wrapping them it in B:IF conditions..
That will need testing. Maybe later. I have to agree with Aneesh, you can simply use the static page conditional tag to prevent auto read more from being applied to static pages. I followed your instructions on creating a sub-domain so that I could use this to create an "about me" static page in Blogger with a different layout to my main post page. Now I have my subdomain what on earth do i do to link it back to my new static page and how do I create the separate layout? Thanks, i appreciate anyone's help in this!
" link it back to my new static page"
You mean your created 2 "profiles", one, a static page and one a sub-domain? What for? does this allow to have older posts, newer posts link and home link to sub-domains????? You can treat a sub-domain as a separate blog with its own different template if you wish and with newer post/older posts links etc. will you please tell me in person how to do this?? I'm hosting a nabble (www.nabble.com/) embeddable forum in a widget on one of my static pages. It's amazingly easy to do. But it's a "frame." Just a window into the nabble web server. I'm assuming that by doing it this was I am getting no SEO value out of what has the potential to be a ton of on topic, keyword rich content. According to Nabble I can host my forum on a custom domain. "you will have to change its DNS configuration and make it resolve to the Nabble server where your forum is located." Two questions - would hosting my forum on my own domain be better for my sites SEO? My gut feeling is yes but would like to hear your input. Second question .... should I (can I?) do it on a static page? Or should it be a subdomain? If both are possible what are the pros and cons of each? Peter ... thanks for everything you do. See How to embed webpage into an iFrame: "Some important notes: The content of an iFrame will not be spidered by search engines which may be a negative point if that is what you want, but to me it is a plus point because it will prevent duplicate content which is not liked by search engines and which may draw a penalty." "would hosting my forum on my own domain be better for my sites SEO? My gut feeling is yes": wise men think alike. "a static page? Or should it be a subdomain?" Static page will be better for your main blog but I don't see how it is possible to reset its DNS config to Nabble server. Since it is a forum and new content is being added continuously, might as well set it up as a sub-domain of your blog since nabble.com allows that. BTW it would be good to get feedback on your progress with your forum. I haven't actually allowed the search engine spiders in yet, or linked to the forum from my blog so noone is using it yet. I've customized the colors to match my blog and it's basically ready to go. But I want to get the domain issues worked out. If I use a subdomain - will probably use www.forum.nyskiblog.com - will I have duplicate content issues? I don't exactly understand. Does changing the DNS mean that there is no duplicate nabble domain for the forum? Peter - I forgot one question. I think you said the subdomain has it's own template. I'd want the page to match. Do I have to start another blog with a separate login or can it all be tied together? If I understand what you originally told me, you said nabble.com allow you to host it in your own domain and not with an iFrame. If so I can't see where would the duplicate content come in. However why don't you clarify with nabble.com? Can I assume that I'd put the new subdomain in the Alias box and the nabble address in the Host name box? Do I include the www in www.forum.nyskiblog.com? "Do I include the www in www.forum.nyskiblog.com?" The above made me think it is feasible but honestly for me it is mainly theoretical, no practical experience. I'm dying to know if the "PERMALINKS" feature will then yield custom domain links vs nabble links after we are done. If so then I think I can be assured that the SEO stuff will work out. Harvey, can you email me via my contact form. The first thing you need is access to the CPanel. From which domain registra did you purchase your domain? Thanks for this article, it really help me how to create but I'm not sure if it's successful coz I'm on enom customer service email. I've sent you email regarding what I did on how to create sub domain, I hope you can help me complete the creation. I forgot how am i going to edit my dns settings? Siromade, have the recent addition of eNom screen shots helped you to edit the DNS settings? Thanks for editing the article, I’m just starting to change what I record last night and follow the steps on enom. Anyway I’m from Philippines. If I understand your problem correctly, if it is my blog, I would republish kalingawankoikaw.siromade08.com back to kalingawankoikaw.blogspot.com and then back to kalingawankoikaw.siromade08.com and see if that helps. Perhaps it is also because you have to wait for the changes to propagate. After I edit and record the subdomain name, then try to open it still error page, but I thought of logging out the blogger and sign back again and try to open and its successfully open, both of them. Thanks so much, it means a lot a lot to me, it's been few days I'm stressing about this, lucky i found you on blogger help. Thanks for your help to everyone. Yea I think it ok now, it should be on creating and recording properly the subdomain. Why you think it's like that? "add subdomain on blog list,"
Please explain what you mean by the above. I mean add on bloglist to link the site on my custom domain and other subdomain to know if it updates like blogroll it says inavalid URL. Not sure what your problem is. See I tested your sub-domain link at testing sub-domain link for commentator and you see clicking on those links will lead to your sub-domain. They perfectly both opened and I've added them too on my blogroll. Myabe it's a glitch only. I followed your instructions on creating a sub-domain so that I could use this to create an "about me" static page in Blogger with a different layout to my main post page. Now I have my subdomain what on earth do i do to link it back to my new static page and how do I create the separate layout? Thanks, i appreciate anyone's help in this!. It work but no need to do anything on the host and your picture are old, now Godaddy is already change the manage page. The problem I am facing here is I already set up the sub-domain as per your article but the thing I am not able to see new sub-domain in the blogger dashboard. I am not getting any e-mail from blogger or Google. I implemented full article as per your guidance. The real problem is where I find my new sub-domain in blogger dashboard. There are 2 issues here, who is your domain registra and who is hosting your blog since you said you went for a free hosting service. The more important is the first, as with that you can tell the domain registra where you blog is hosted and it need not be that free hosting service. You will need to tell your domain registra via their CPanel that your blog is hosted on Blogger service and just forget about that free hosting service. Next time if you want an easy time, register your domain via Blogger and Google Apps and most things will be done automatically for you. hey, is there a way to make a subdomain that I can change. Example: I want to have my original site example.com to stay how it is. But I would like contact.example.com to show my custom html page, is there a way of doing this with enom.com? If not clear ask again then maybe I do a new post. Hi Mr.Peter,thank you so much for this post (How to create subdomin) really it is very useful post.i am really apriciate with you.thanks. Hi peter, after clicking on the particular domain, I don't see total DNS window. There's a DNS manager column and after clicking launch, this error note appeared "The zone file for this domain cannot be managed within DNS Manager. Click OK to return to the dashboard." Which is your domain registra? I have puchased with blogger.com from Godadday. But now I am unable to sign in to Google App account. Go to https://www.google.com/a/cpanel/dsjobalert.com/Dashboard and click "Cannot access your account" and try to work it from there. Thank you for this tutorial! Just so you know, GoDaddy has updated their website, and it's now "DNS Manager" and "Launch" instead of "Total DNS" and "Total DNS Control." And then to add the CNAME, you need to click "quick add," and I suspect that for Host, you only need to put what you want before the .yourdomain.com, not whatyouwanttoput.yourdomain (as all the previous CNAMES are only "calender" "docs" "mail" etc. So I tried it that way, and we'll see if it works. Then to save, the black button at the top of the page is "Save Zone File." Thanks again for the help! very nice and infromative article. Thanks you Peter. I will contact you to lead me a little bit about my blog, I am a new user. I have followed these steps for eNom. 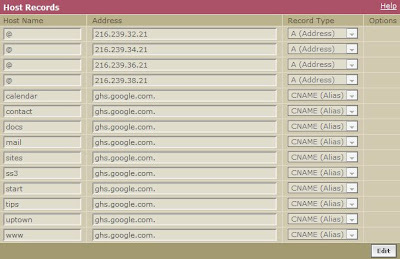 I add the new host record called "home" and point it to ghs.google.com and change to Cname alias but how do I make home.domain.com redirect to domain.com/p/home.html? home.domain.com is a sub-domain while domain.com/p/home.html is a static page. I have used abc.domain.com as a seperate blog with blogger like for example tools.bloggertipsandtricks.com which is a blog detailing some tools for blogger. Perhaps ask your question over at Blogger Help Forum and give me the URL of the thread. Thankx for this important post. Hi peter, I started to use subdomain first than the root domain itself because I still in preparation and the www and root domain has been pointed to ghs.google.com. Sadly mysubdomain and blogspot is gone from google index after 3 day. What does it means? is it normal for customizing a blogspot to subdoman? If you have a Blogger blog hosted with Go Daddy,Google or Blogger have now made it easy to map your custom domain to your Blogger blog. I deleted some of my old Blogger blogs that I don't use any more and I was able to redirect my custom URL to another of my blogs to change the URL. But you can only do this with Go Daddy not Enom. But the problems is that when you buy a domain through Blogger you do not get to choose who you want to be with. Your domain will either be registered with Go Daddy or Enom, but you do not have a choice. I think we should be able to choose which host we want when we buy through Blogger. As Go Daddy settings are more user friendly than Enom's. Andrea. Upgrade to new Blogger designer template and choose a 4 column Layout. That is the easiest option. Hey, I copied pasted my sign-in-name and password in Advanced DNS settings but it said "Authenticatication failed. Please try again." What might be the reason? I have created sub domain from ENOM Control Panel. IS it Possible to do ? If YES then How ? Your blog - sub domain, do you mean a sub domain of blogspot.com? eg mydomain.blogspot.com. And you are using this blogspot for custom domain hosted by Blogger. If so, all backlinks will be redirected to custom domain by Google/Blogger.